Delighted to show you our cattle - so contact us! M90 and A90 from Edinburgh – over the forth road bridge towards Perth and Dundee, then on to Forfar and take the second turning to Forfar, opposite a MacDonalds. Travel 1 mile to Forfar, over the traffic lights to the town centre. At the 2nd (and last) set of lights in Forfar turn right towards Carnoustie and Letham on the B9128. After approx 1 mile you come to the village of Kingsmuir and after the first bungalow turn right along Kingston Road. 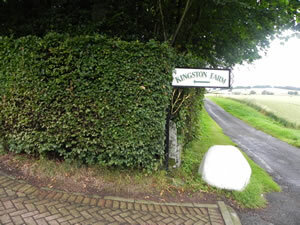 50 m turn left to Kingston Farm. Take the A90 from Aberdeen and turn off at the 2nd turning to Forfar by a MacDonalds. Then continue to the farm as above.